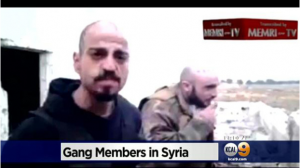 The FBI is investigating two Los Angeles-based gang members who are accused of fighting alongside terrorists in Syria, CBS LA reports. A video shows two unidentified men shooting AK-47s while apparently giving shootouts to their gangs. “Look homie, check this out,” one man said. 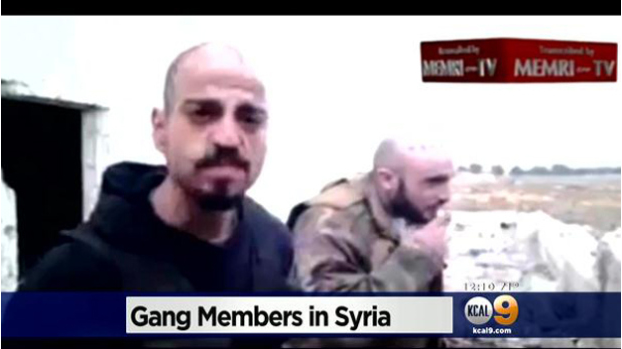 The men are known as “Creeper” from G’d Up-13 and “Wino” from the Westside Armenian Power. They were fighting alongside pro-Hizbullah and pro-Assad forces. “The Joint Terrorism Taskforce is aware of the video and is investigating to determine any potential threats to Americans or U.S. interest,” FBI spokeswoman Laura Eimiller said. Posted: 3/5/14 at 9:05 AM under News Story.